The geniuses who created the world’s smallest stop-motion animated film have now turned their talents toward a completely different goal: creating the world’s largest stop-motion animated film. Still using the Nokia N8 smartphone, the team spent an entire day painstakingly creating this delightful life-size short film. All told, the gigantic film, Gulp, was formed on 11,000 square feet of beach with a full-size boat and a real human “puppet.” A whole team of animators worked diligently to set up every moment of the film, second by second. 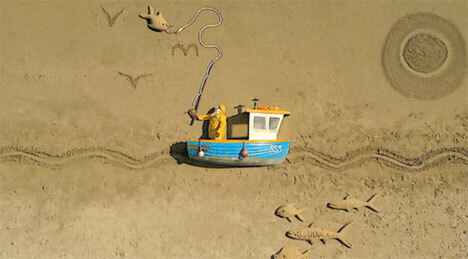 They drew figures in the sand and posed the “puppet,” then made tiny changes in preparation for the next frame. The film was shot as a series of photographs, consuming over 16 hours of shooting time. The making-of video details the complex setup that led to this short video. A crane suspended the filmmakers high above the beach, where they used three Nokia N8s to capture every moment of the fun, animated action.